Sometimes a dragon just wants an aloe rub, a glass of ice water, and to get a little appreciation around here! After reading Wednesday’s comic, The Man was immediately incredulous that a fire breathing dragon could possibly burn. Game of Thrones has taught us that much. I must attribute his newfound ability to anticipate me to my excellent tutelage in understanding story structure. At least my real life sunburn has faded. The Man, of course, cannot say the same, because he is so very white. 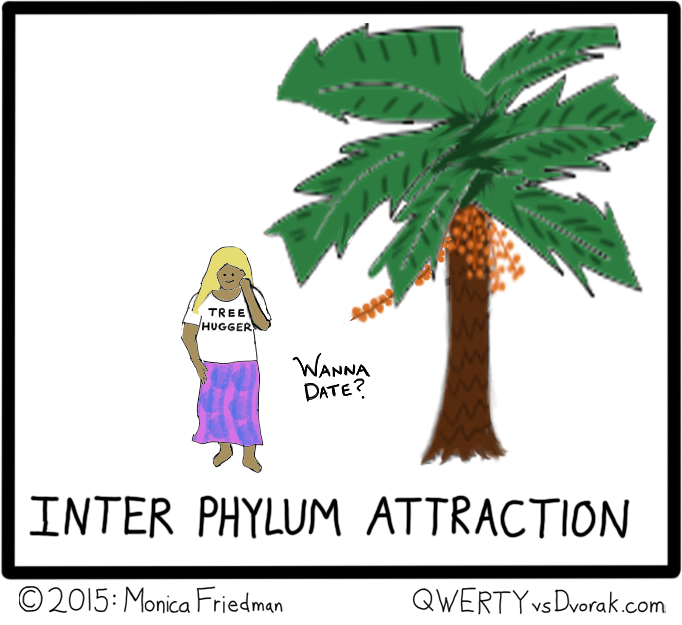 Relationships, of course, require mutual caregiving. Even when one party doesn’t have an expressible need. Sometimes you just need someone to bring you a glass of water. 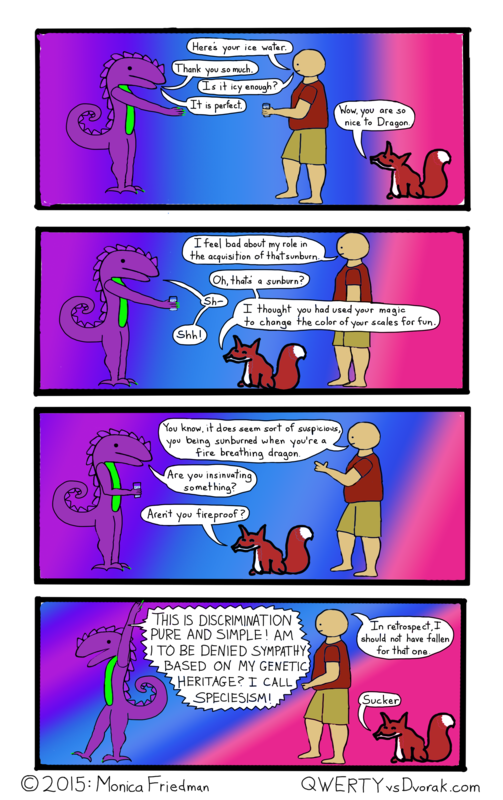 This entry was posted in dragon comics and tagged burn, comics, dragon, fox, speciesism, sunburn, sympathy, The Man on May 29, 2015 by littledragonblue. The more I play around with the “Enhance” feature in Adobe Photoshop, the more I question the nature of reality. If a photograph isn’t a perfect visual representation of a moment in time, how can we trust something as subjective as memory? 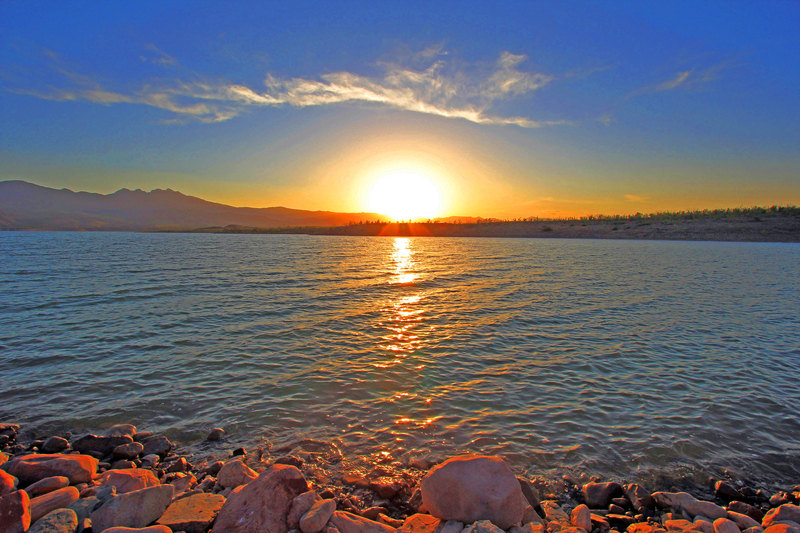 The Man and I watched this sunset, and I’m certain that every moment was dazzling, and that the stones on the lakeshore truly did glow in the golden light of the setting sun. And yet, the original photograph was flatter than memory. Then I messed with the levels in Photoshop; now the stones glow. Still, did they glow to that degree? The sky probably wasn’t quite so blue, and of course the sun was sharper. Complicating matters, I have long since stopped trusting my own eyes. My vision gets worse every year; I wear prism lenses to correct some of the problem, further distorting my view of reality, even though my brain corrects back to true, most of the time. In addition, I don’t do anything in natural light without polarized lenses, which sharpen everything and amplify colors. The world looks much crisper, and more beautiful, in polarized lenses. This one, obviously, can’t be right. It reminds me of a picture postcard from the ’50s, when, I guess color photography was a novelty and all the colors were boosted into glorious technicolor. The sky is even bluer than in the previous image. 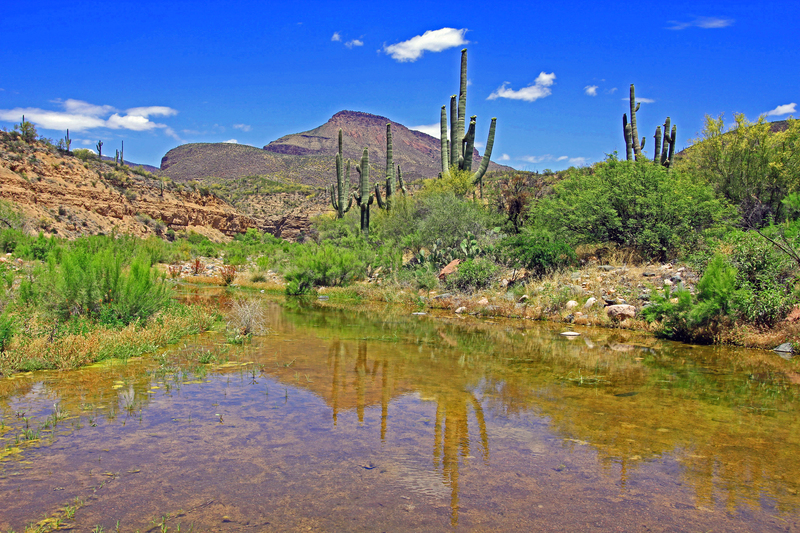 This was a fast fix; results would probably be better had I worked on different parts of the image separately: the sky, the saguaros, the rest of the plants, the rocks, the water. At heart, I see with the eyes of a child, and the brighter colors delight me. I’ll take paintbox primaries over reality any day, I guess. This is the most confusing one. 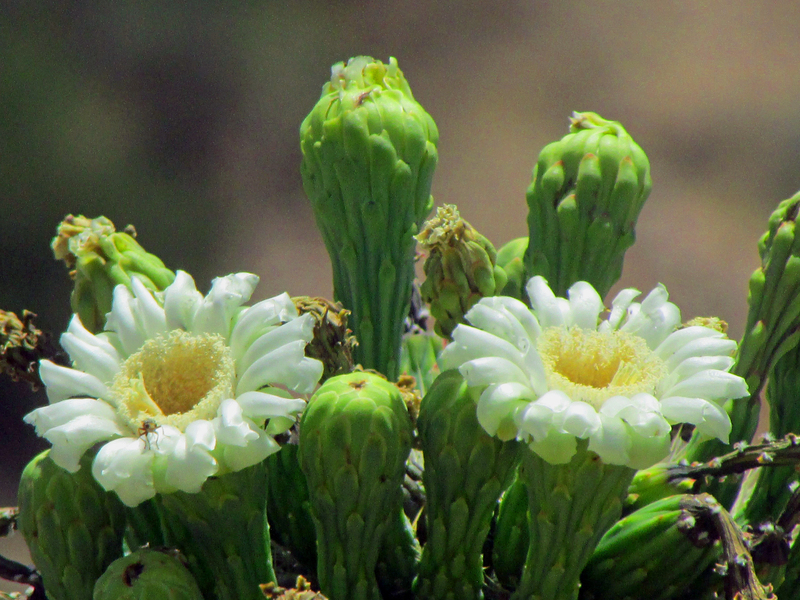 I still don’t have a zoom lens for the Canon EOS, and if you know anything about saguaros, you know that getting close to their flowers can be tricky. Most of the flower are on the top of the plant, and a mature saguaro can grow as high as 50 feet, while I myself stand only a touch over 5. We spent days looking for a cactus that was either growing below the ridge, or else had a frostbite damaged arm that hung in my line of sight. No such luck on this trip, and the saguaro only blooms for a short while. I had to resort to the Powershot, which has a great zoom feature, even though the picture quality is of course not as details as with the DSLR. But here’s the thing: the zoom feature is much better than my eyesight, so good that I have often used it in place of binoculars. It allows me to see things in sharp focus that would otherwise appear as distant blurs. So I couldn’t even tell you what these flowers really looked like because I never really got a good look at them myself. I couldn’t even really see the display since the sun was shining directly on it AND I was wearing polarized lenses. This photo pretty much involved just waving the camera in the general direction of the thing I wanted to shoot and hoping for something to line up. So, what does the world look like? It’s not exactly what I see with my eyes, even with corrective lenses, and it’s not precisely what the camera returns to me, and it’s definitely not what photos look like after hue and saturation and balance. Every image is filtered these days; everything is Photoshopped. We can’t trust the visual world. This entry was posted in wacom tablet and tagged color correction, eyeglasses, photoshop, photoshopping, polarized lenses, reality, sight, vision on May 28, 2015 by littledragonblue. And you forgot the ice water! This is the comic I would have posted last night, had I not been completely road burned from our epic drive through the Tonto Wilderness over the Mogollan Rim. I actually wrote the script last week; and it’s moderately ironic, because The Man and I were hiking in the desert on Sunday and even though we wore sunscreen, we both got burnt. I only burned a little, as my ancestry is Mediterranean and my whiteness comes with a decent amount of melanin all things considered. The Man, however, is of the Nordic persuasion and couldn’t be much whiter if he tried. His sunburn was especially hilarious because he wore a knee brace (on account of the 3 pins he got in his knee after driving a motorcycle into a guard rail) so he has a perfect red circle on his knee, inside a perfect white square. It’s a unique burn. I helped him with the aloe. Other than that and perhaps 1 or 2 tiny inconveniences associated with camping in a place with no services, if you catch my meaning (i.e. no plumbing), it was a stellar trip. We saw many wonderful creatures: jackrabbits, quails, egrets, herons, hawks, buzzards, and so on. Fish were literally jumping out of the lake. Flowers were blooming all over the desert. The weather couldn’t have been lovelier; ditto the scenery. We were on the north side of Lake Roosevelt, where no one goes unless they have a boat. We pretty much had to drive down a cow track to get there, and we had an entire cove to ourselves. So that makes up for the lack of plumbing. 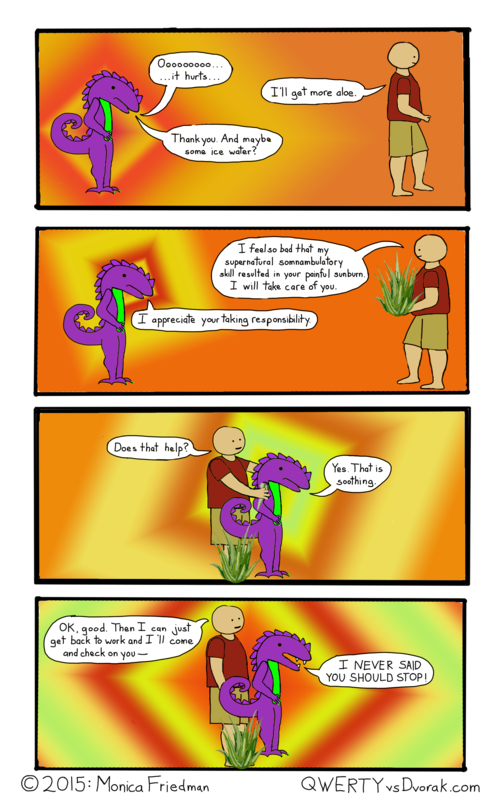 This entry was posted in dragon comics and tagged aloe, birds, camping, comics, dragon, lake roosevelt, nature, plumbing, sunburn, wilderness on May 27, 2015 by littledragonblue. If all goes according to plan, when this little drawing goes live, I will be way, way, WAY off the grid, far away from any sort of amenity that features running water. This is a shame, because, while I love nature, I am also fairly dependent on those running water features and am uncertain how I will do without them. At least without the most necessary one. However, we will be next to a lake, so there will be *some* options. Camping is not a big one in my repertoire. I’ve gone a handful of times, but always to a campsite with bathrooms and fire pits and such. I don’t have any camping skills, except for the ability to cook gourmet meals over an open fire. That’s actually the reason I don’t have any camping skills: I would always be so busy cooking that other people were required to pitch my tent, &c. It’s another one of my super privileges. No one has ever even considered that I should learn to pitch a tent. It was always assumed that someone else would do it for me, because I was cooking a 3-course meal over an open flame in the dark. That’s just how I roll. We’re not even going to pitch a tent: we’ve got a futon jammed into the back of a Honda Element. I have a decent expectation for us being more or less comfortable there. It should be dark; even the moon is just a bitty sliver this weekend. It should be quiet; there will most likely be very few people around, if any. Well, if this site is never updated again, you’ll know why. I’m lost in the wilderness and have possibly been eaten by a bear. The birds I’ve drawn are just fanciful birds. The balloon and the feather/leaf thing are me working with light. The balloon seems to have come out pretty well, for what it’s meant to be. For the feather, I was messing around trying to draw an iridescent effect. It’s not perfect, but it’s better than I could have done before I drew the blue morpho butterfly. The quote above is from Dr. Seuss’s Oh! The Places You’ll Go!, which I read every year to kindergarteners the penultimate week of school. It’s summer break already around here, which is a good time for adults to stop and take stock. Oh! Also, I finally wrote a kids’ book review for Best Children’s Books, a site I haven’t posted on in more than a year: Brown Girl Dreaming by Jacqueline Woodson. Read it! Then click on the Amazon link! Anyway, I’ll be in the desert. 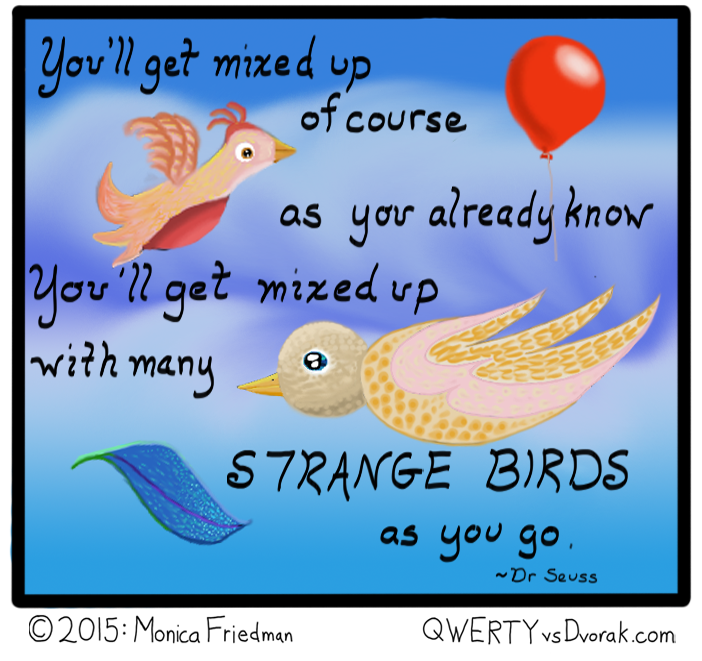 This entry was posted in Comics and tagged bird, comic, dr seuss on May 25, 2015 by littledragonblue. I had intended to post 2 comedic drawings of teddy bears tonight, but I was offered the opportunity of a free sitting with a sought-after photographer, one who usually charges a decent amount of money for people who don’t fit his perfect profile in terms of the models he wants to shoot, and nobody has ever mistaken me for a professional model, so in the interest of feeding my midlife crisis, I decided to do that instead of work, and now it’s after midnight and there’s no time or headspace to finish my weird teddy bears, so here, have a mandala. This is a very desert-y one, all spiky with wild grasses and dry thorny twigs. It appears flammable. Some of the grasses are probably non-native invasives, whose presence tend to change the character of the desert, and make it more susceptible to uncontrollable wildfire. Usually, they’re pretty prevalent at this point in the season, but it’s been the wettest spring I can remember around here and there’s still plenty of green to choke out the brown. 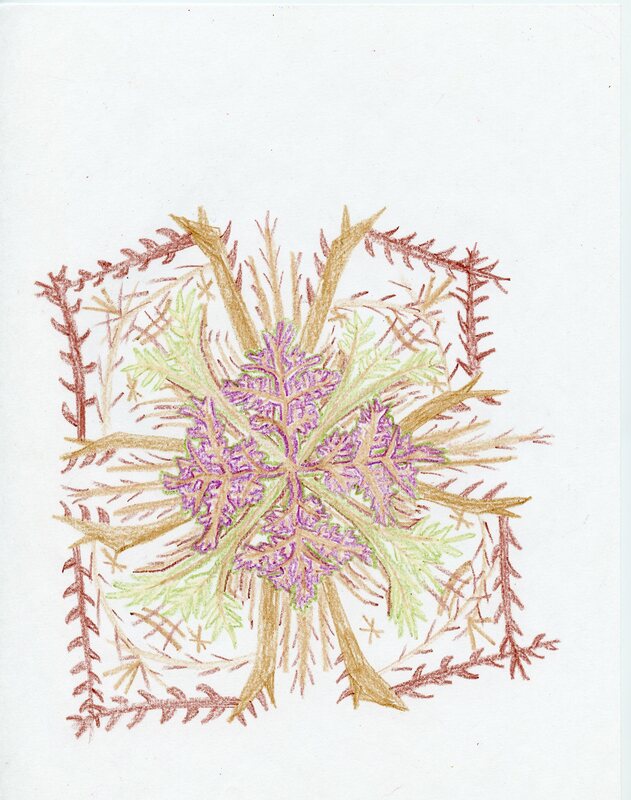 This entry was posted in mandalas and tagged grass, mandala, nature, sticks, thorns, twigs on May 21, 2015 by littledragonblue. We used to have a concept book about color when we were kids, one with transparent pages that stacked up to reveal different colored animals. There were a bunch of creatures, all in different colors; the ones you saw depended on which pages you looked at and also which direction you looked. That always fascinated me. So that’s a basic visual gag. This comic is also about The Man’s remarkable ability to fall asleep at any time, anywhere. I have seen him fall asleep in the space of 45 seconds. I have seen him sleep with small children sitting on top of him. I have seen him sleep on the ground. I have seen him fall sleep even though he’s only been up a few hours and slept 8 hours the night before. His happy ability to nap inspires insane jealousy in me, the chronic insomniac. Anyway, It’s been a couple weeks since I’ve drawn a comic but it was fun to get back. 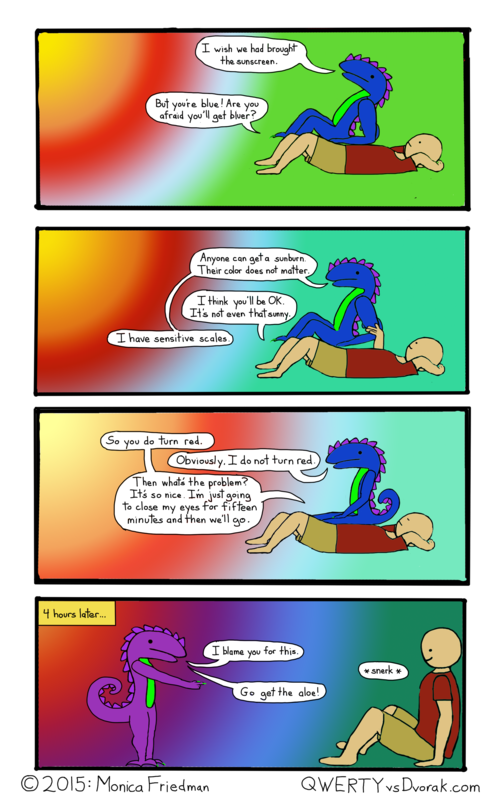 This entry was posted in dragon comics and tagged burn, comic, dragon, dragon comics, man, sun, tan on May 20, 2015 by littledragonblue.